On the sidelines of the United Nations General Assembly, President Donald Trump on Monday previewed a new tradition he would like to institute: a parade of military pageantry in the nation's capital in the style of the one he attended in Paris for Bastille Day this year. 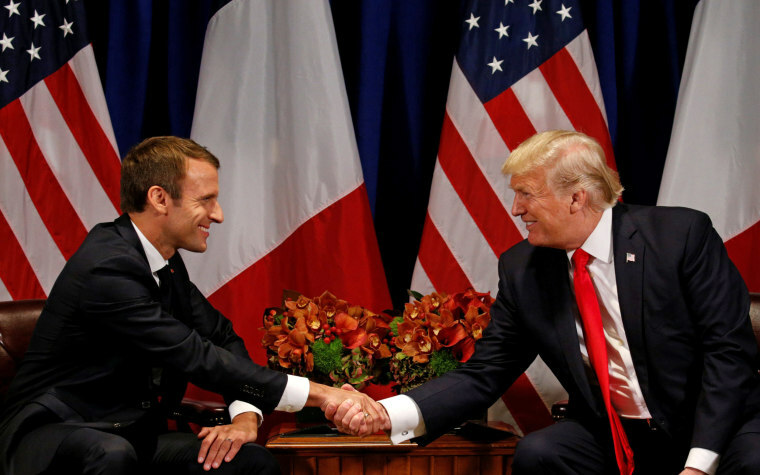 "To a large extent, because of what I witnessed, we may do something like that on July Fourth in Washington down Pennsylvania Avenue," Trump told President Emmanuel Macron of France before the two met in New York. Trump praised the display of French military might as "tremendous" and "beautiful." "We'll see if we can do it this year," Trump said during the friendly exchange with Macron. The two did not take questions from reporters. As the gathering of world leaders and diplomats gets underway, the focus this week will center on important global matters such as terrorism and North Korea's nuclear provocations, among other issues. Trump offered hope earlier in the day for the future of the U.N. — an organization he previously derided as inefficient. Speaking at a session aimed at reforming the U.N., Trump said the body had "not reached its full potential" in recent years because of "bureaucracy and mismanagement." He went on to express faith and support for U.N. Secretary General António Guterres' "great reform vision" and commended him for ushering in much needed change in the deliberative body. Though the U.N.'s budget and staff have increased, "we are not seeing the results in line with this investment," but Trump added that under the secretary general that's "changing fast." "I think the main message is 'make the United Nations great.' Not again, 'make the United Nations great,'" he told reporters later as he exited the U.N. when asked what message he'd like to communicate to the General Assembly. "Such tremendous potential and I think we'll be able to do this." The president also encouraged member states to "look at ways to take bold stands at the U.N., with an eye toward changing business as usual and not being beholden to ways of the past, which were not working." As he talked about the U.N.'s potential, Trump, a New York native, noted that he "actually saw great potential across the street," where a building bearing his name stands. Arriving at his first General Assembly, Trump previewed a "great week" ahead and referred to the ongoing tensions with North Korea. "I think that most of you know how I feel," Trump said of the topic, which is sure to come up both in bilateral discussions throughout the week and Trump's highly anticipated remarks to the group on Tuesday. In the past, Trump has been highly critical of the U.N. But as president he has also been helped by its work — especially on North Korea. The U.N. Security Council approved new sanctions on North Korea last week, with Nikki Haley, the U.S. ambassador to the U.N., telling reporters that the response is now "totally in (Pyongyang's) hands." Though North Korea will surely be a focus for the president this week, he also faced questions about the fate of the Iran nuclear deal, a 2015 agreement with U.S., Russia, China and three European powers that lifted some sanctions in exchange for Tehran curbing its nuclear program. Trump has been vocal in his dislike for the arrangement. When asked by reporters prior to a bilateral meeting with Israeli Prime Minister Benjamin Netanyahu on Monday if he intended to remain in the deal, Trump said, "You'll see very soon." Senior administration officials said Trump's high-profile address on Tuesday to the full U.N. General Assembly will underscore his "America First" vision on the world stage. The emphasis, according to National Security Adviser H.R. McMaster, will be on promoting peace and prosperity while urging all nations to come together to address grave dangers that threaten the global community.